We all want to feel confident in the company we work for. We also like to think that we are contributing to the company’s success. If possible, we also like to share in that success. Some companies allow you to share in their success by allowing you to own some of the company’s stock—then, if the company does well and the stock price goes up, you build wealth along with the company. It’s a win-win. You are motivated to do your job well so that the company does well. But can it be too much of a good thing? There are several ways that you can invest in your company. A lot of companies will offer their employees a discount on the company stock. They will allow you to have some money deducted from your paycheck and will use that money to buy shares of the company stock. They usually offer it at a discounted price that can range from 5 to 15%. Other companies may offer their stock as part of a match that they make to your qualified retirement plan. And other companies make the stock available as a choice in the menu of investment choices in their 401(k) profit and/or profit sharing plans. So, what can go wrong? Just like most things in life, moderation is key. A little bit of something can be good. Too much of something can become a problem. Owning too much of your company’s stock can become a real problem. If the company runs into a rough patch, your personal wealth can suffer. In fact, it can be a bigger problem because your paycheck and your investment accounts both depend upon the success of your company. History has many stories of companies that at one time seemed solid and in a short period ran into hard times—think Enron, Kodak, and Lehman Brothers, just to name a few. A lot of employees in those companies lost their jobs and their retirement because they never would have imagined the hardships that hit their company. 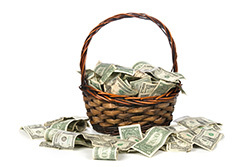 We all know that one of the most basic rules of investing is to not put all of your eggs in one basket. We know that we should be diversified. But when it comes to our company stock, we sometimes let our emotions replace our logic. We want our company to do well. We think we are helping it be more successful. Whether it’s through an employee stock ownership plan (ESOP), discounted shares, or shares we’ve purchased in our retirement plan, we accumulate small pieces of our company over a period of many years. It can often become a much larger part of our overall investment plan without us even realizing it. Don’t get me wrong; I’m not against owning company stock—although I admit I’m not a real fan either. If you are confident in the future of your company and you want to take an ownership stake, there’s nothing wrong with that. But just make sure to diversify. If 5–10% of your overall investment portfolio is invested in your company, that is probably OK. It’s when the stock becomes a bigger piece of your investment pie that you are taking on more risk than you might know. I’ve seen several situations recently when company stock made up 20, 30, 40, even 80% of someone’s investment portfolio. That’s extremely dangerous—no matter what company it might be. Think about it another way. There are around 4,000 actively traded public companies in the U.S., and that number doesn’t include private companies that have employee stock available. Of all those companies, which one would you invest nearly all of your money in? Amazon? Apple? Starbucks? Your company? It’s a big risk to put too much of your money in one basket. Would you take that risk with any other company? Newer PostHow Do I Replace My Paycheck When I Retire?